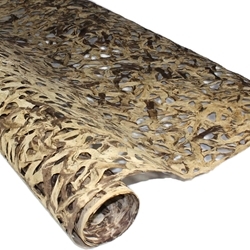 Hand-crafted brown and cream bark paper with a unique spiderweb pattern. Made from Amate, Nettle, and Mulberry trees, the unique and earthy tones of the trees perfectly blend together for an incredible crafting paper! The Spiderweb Amate Paper shapes concentric circles into a mesmerizing design. Measures approximately 47" x 95"